The Mission of the Star of the Sea Guild shall be to foster and increase the spiritual life of each member, to help raise money for the Parish and other charities, and to stimulate the members' social lives. The National Council of Catholic Women acts through its affiliated organizations to support, empower, and educate all Catholic women in spirituality, leadership, and service. NCCW programs respond with Gospel values to the needs of the Church and society in the modern world. and so enjoy her blessed presence in the life to come. that we may be wise, courageous and loving members of the Church. and compassion for all God's children. All women of St. Mary, Star of the Sea, Parish are encouraged to join our Women's Guild. The membership fee is $15.00 per year. You will receive an annual booklet which describes in further detail all the events of the year and includes the ladies involved in each event. Best of all, your booklet will have a complete listing of all GUILD MEMBERS with their home addresses, phone numbers and email addresses so that it will be easy to stay in touch with your friends whether here or away. Do not hesitate to contact the church office at (941) 383-1255 for further information. WELCOME! Thrown on life's surge, we claim thy care, Save us from peril and from woe. Virgin most pure, Star of the Sea, Pray for the sinner, pray for me. 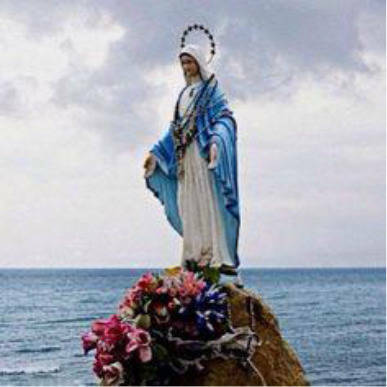 Do thou, O Queen, Star of the Sea, Pray for thy children, pray for me.